The African Mango (Irvingia Gabonensis, also commonly known as bush mango or wild mango), grows in North-west Africa in the wild jungles of Cameroon. It looks different to the mangoes grown in the tropics. Their nuts are usually dried in the sun & sold in powder form or whole. A 2009 double-blind placebo controlled study of the seed extract of the African Mango, indicated that it "significantly reduces body weight & improves metabolic paramaters in overweight humans". The group received either 150mg of IGOB131 or a matching placebo 30-60 minutes before lunch or dinner. "Significant improvements in body weight, body fat, and waist circumference as well as plasma total cholesterol, LDL cholesterol, blood glucose, C-reactive protein, adiponectin and leptin levels were observed in the IGOB131 group compared with the placebo group." In comments from Dr Julie Chen, she says that "if patients consumed soluble fiber in other forms, similar health benefits could occur that are comparable to that of African mango". All people have to do is "eat a mostly plant-based diet, and the fiber in that diet would do the same job in assisting with weight loss while costing them much less money and gaining much more benefit from the wide array of nutrients found in the whole plants rather than from the supplements." 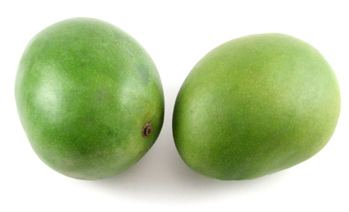 See South African mangoes for more information about Mangoes production and export in South Africa.